In dem 4tägigen Programm aus 11 Keynotes und 10 Workshops zu Figuren aus und in Filmen, Serien, Animation, Videogames, Pen&Paper-RPGs, Cosplay und Lyrik kommt insbesondere auch Comics und Manga eine außerordentlich große Bedeutung zu. Mit Jaqueline Berndt (Stockholm), Jan-Niklas Meier (Bielefeld), Christina Meyer (Osnarbrück), Stephan Packard (Köln), Johannes Schmid (Hamburg), Jan-Noël Thon (Nottingham), Jeff Thoss (Berlin) und Vanessa Ossa (Tübingen) ist die ComFor-Beteiligung insgesamt auch recht hoch. 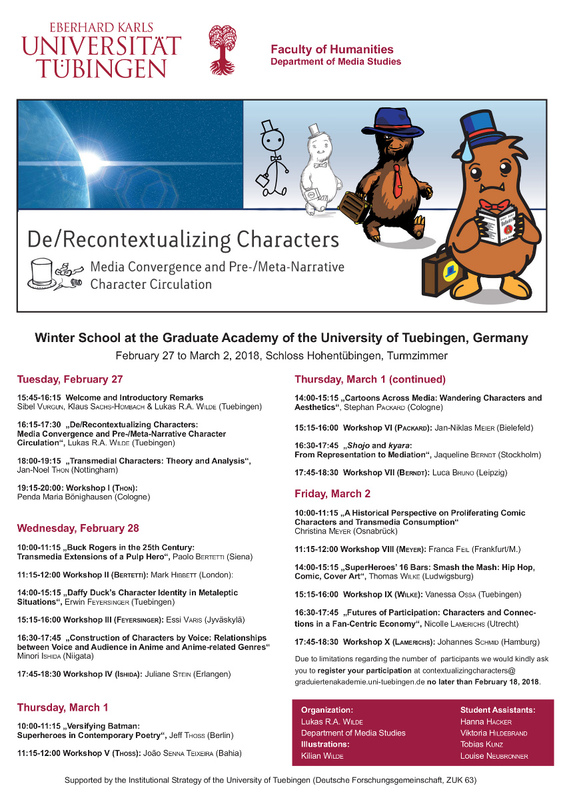 Eine Teilnahme ist jederzeit möglich, um Anmeldung unter contextualizingcharacters (ät) graduiertenakademie.uni-tuebingen.de wird gebeten. Die Winter School wird durch das Zukunftskonzept der Universität Tübingen (Deutsche Forschungsgemeinschaft, ZUK 63) ermöglicht und von Lukas R.A. Wilde organisiert. „Characters are essential for what is discussed as ‘media convergence’. This term, usually attributed to Henry JENKINS (2006), addresses two interconnected dynamics: on the one hand the expansion of narrative works and worlds by means of different media forms and platforms; on the other, participatory practices related to the creation of user-generated content. Characters can not only be considered the ‘currency’ of and between different forms of media, as Rainer LESCHKE found (2010: 11). In many cases, they also serve as a kind of ‘fuel’, as an incentive for both dynamics mentioned above. Marc STEINBERG, in his historically-oriented media studies survey of Japanese character marketing, considered a character consequently as “an entity that … both supports the transmedia movement and environmental diffusion … and refuses to be pinned down in any one medial incarnation“ (2012: 44).